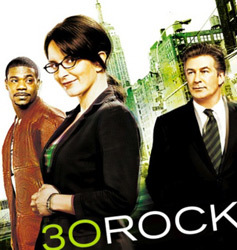 I don't know why, but it took me forever to finally get around to watching an episode of 30 Rock. Where have I been? How did I miss it? Thankfully, both seasons are on DVD, and in a single afternoon, you too can get acquainted with the one of the only genuinely funny sitcoms to have been made in recent memory. It is sheer brilliance at times, and never really falters throughout both seasons (though I would have cut down the time Liz Lemon and Jack Donaghy were in serious relationships). For the most part though, it just keeps getting better. Hence the Emmy Award – although unlike Everybody Loves Raymond (which I found weirdly depressing and not ever funny) this Tina Fey penned gem is more than worthy of the honor. There are lines that will have you laughing out old and repeating to friends. Why, just this weekend when we saw our friend Matthew and 30 Rock was mentioned, he turned to me and said “What am I, a farmer?” If this makes no sense to you, I won't ruin the joke with a poor written attempt to capture the delivery of Alec Baldwin – who is magnificent in his role as a rich mentoring executive. No seriously – MAGNIFICENT – there is a scene in season two, you'll know it when you come to it – watch that and try to dispute me. Shockingly, as good as he is, the rest of the cast manages keeps up with him. Not a single character is superfluous or annoying, which is a testament to the writing as well as the actors. Tracy Morgan is hilarious as Tracy Jordan, a difficult and insane former superstar who made a fortune in films like Honky Grandma be Trippin' and President Homeboy. There is no official mention of who or even if he is based on a real person, but there are touches of Eddie Murphy and Martin Lawrence. Other favorites are the innocent, devoted page Kenneth Parcell, played by Jack McBrayer, and Scott Adsit as the grounded good guy Pete Hornberger. I really can't recommend this show enough. The ins and outs of producing a SNL type variety show bring to mind the classic Larry Sanders Show, and that is a huge compliment. New shows were to begin in January but are on hold indefinitely due to the writers strike. If there were ever a place to prove to the bigwigs how important writers are they should sit down and watch 30 Rock, and so should you.